2 Comments Published by Cedric Benetti on Thursday, October 15, 2009 at 10/15/2009 11:20:00 PM. 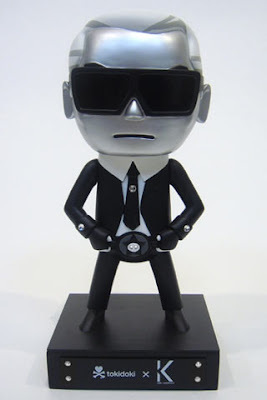 Get ready to hit Colette store this month to get your very own Karl Lagerfeld Tokidoki figurine (129 Euros) in a limited edition of a thousand pieces! It's fun! It's plastic! It's useless except for aesthetic criterias, in which case money is the only yardstick to measure your approval as a collector! I think I'd rather get a Chanel purse or some new sunglasses. By the way, can you get them any cheaper in Paris? Phew...(129 Euros?!?) I guess you do have to be a collector. Merci, for sharing...the link too!